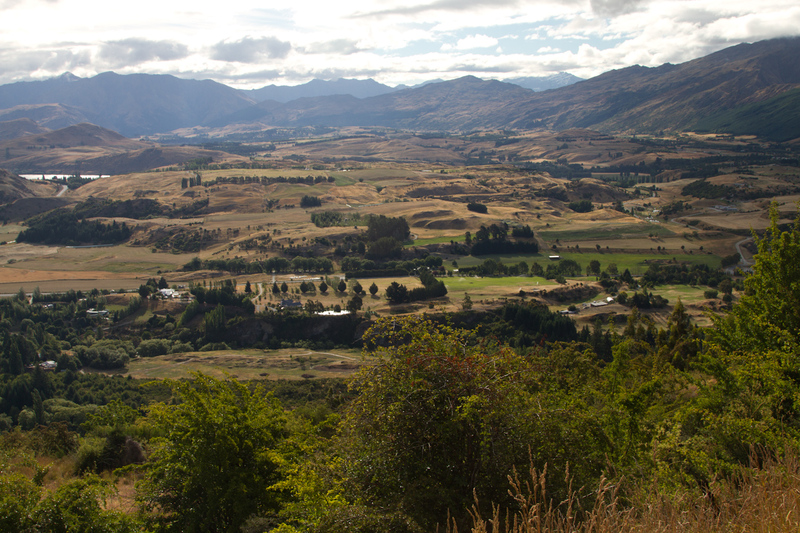 The good thing about Arrowtown, apart from the high density of restaurants for such a tiny place (!) is that with a bit of effort, you can make it to the very southern end of the Alps or the very northern end of Fiordland on a day trip and still leave yourself time to do a hike. We decided to leave the house at 8.30 in the morning and push over to Mt Aspiring National Park for a hike that was supposed to be both easy and pleasant. We had been driving along for about 20km when we noticed we were running out of gas. There was no way we would make it to Wanaka, and I doubted there was gas in Cadrona so we got the gps out to try to find out. 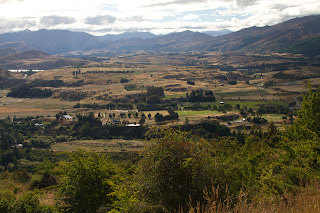 It turned out we were going to Wanaka the long way, via Cromwell, which was just as well. There is gas in Cromwell. We reached Wanaka without incident except Mike falling asleep at the wheel and me taking over. 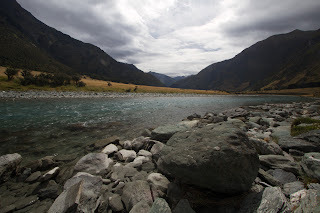 I went tumbling along 33km of good dirt track along the Matukituki river. It is a beautiful valley, incredibly flat, filled with grass, lines of trees and sheep, and surrounded by steep golden mountains. Eventually we reached the car park, 2.5 hours after we set off,, and decided we needed lunch. It is a very good thing this is a short and easy walk. Even from where we sat and ate lunch, we could see glaciers in the distance. Our path led us up across a very bouncy suspension bridge and along a windy path through typical New Zealand fern forest to prairie just under the Rob Roy glacier. The view was beautiful, and we sat around for quite a while, drawing, photographing and mutually being teased or teasing the keas. Keas are New Zealand's native alpine parrot. They are intelligent, sociable and utterly amoral : ). Leave something lying around and they will come and see how to take it apart. "Butter wouldn't melt in my beak." We came back the short way via Cadrona and eventually reached a high pass we remembered from our previous trip to New Zealand, looking out over immense vistas of Otago. I stood looking out at the view, thinking that four months was still not going to be enough and that yet again, I was not going to be ready to leave New Zealand when the time came. I consoled myself by fantasising about Antonia moving here when she grows up, so I can make like all those other elderly British people we keep bumping in to who winter down here every year to 'visit their children'. If she doesn't we may just have to winter down here anyway.